The Portland Sea Dogs have made a couple of roster moves today. First off, outfielder Bubba Bell is heading to Pawtucket. His roster spot will be taken by Matt Sheely from Lowell. Next up, pitcher Felix Doubront was sent to the DL, retroactive to the 13th of June. 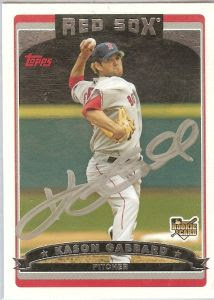 His spot on the roster will be taken by Kason Gabbard, who was re-acquired by the Red Sox from Texas on April 29th. Gabbard, who pitched in Portland from 2004-2006, will start Thursday night against Erie. Tickets are available at Sea Dogs.com.